If there is a magical elixir that promises youth and beauty, I’m all over it. I want fountain of youth flowy hair and shining, supple skin. But you can’t cheat aging. Can you? When we started hearing about supplementing with collagen and its cousin gelatin years ago, I was intrigued by the purported benefits ranging from healing leaky gut to improvements in joint health to wrinkle free skin and long, strong hair. I started adding gelatin to smoothies and making treats out of it, like this strawberry pudding. But I didn’t see a ton of benefit (more on that later). Fast forward to the present wherein we have access to some pretty wonderful collagen products that do, in fact, support joint, skin, gut, and hair health. 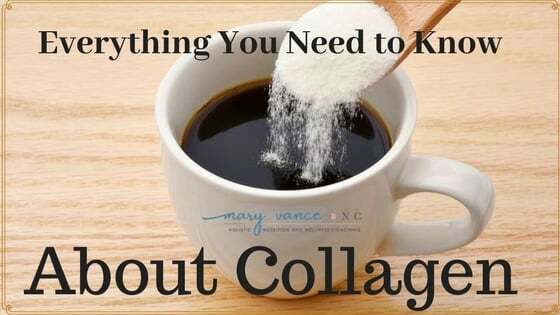 But navigating all the different collagen options out there is confusing. And how do you know collagen is right for you? Most importantly, does it work? 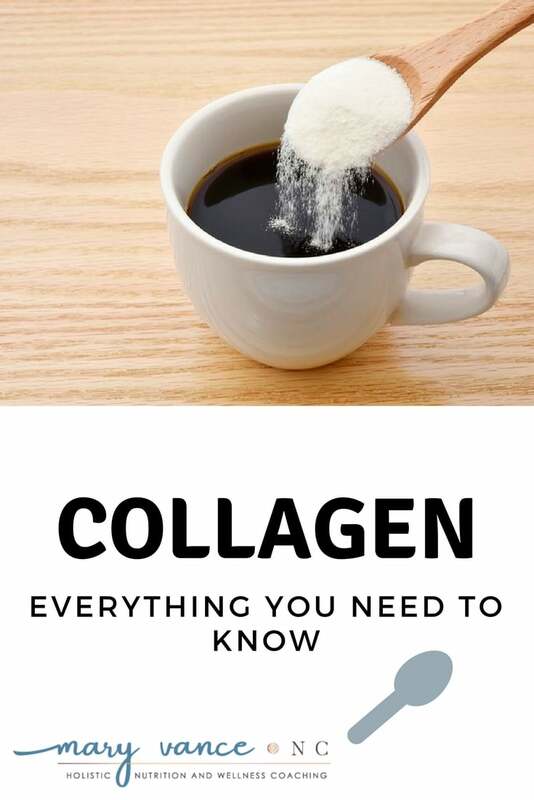 Collagen is the most plentiful protein in the body, the raw material that is needed to build skin, bones, connective tissue. As a protein, collagen contains the amino acids needed for structural repair in the body. The sad news is that collagen production starts to decline at a rate of about 1 percent a year starting around age 20. By age 40, most people will have lost between 10% and 20% of their collagen levels, and that contributes to thinning hair, creaky joints, and saggy skin. You’ve probably heard of gelatin, which is formed from the tendons, ligaments, and bones of animals. Collagen or collagen peptides is simply gelatin that has been more hydrolyzed to form smaller proteins, which are more easily digested and absorbed by the body (apparently gelatin is a large protein). So collagen is easier to absorb and may work better for some people (which may have been why I didn’t notice a huge benefit from using gelatin). Gelatin is a thickener and gels whatever it’s added to (think jello). That’s why you always see it in recipes for gut healing gummy snacks, mousses, and puddings. Collagen is easily dissolved in water and can be added to liquids without thickening them. Though gelatin and collagen have the same benefits, I think collagen works better because it’s more readily absorbed. Read more about collagen vs gelatin here. I guinea pig myself with every supplement I recommend, and I’ve been taking this collagen supplement for about a month now, daily more or less. It’s a powder you mix with water and is specifically designed to support joints, skin, and hair. I have noticed a HUGE benefit. 1) Perhaps my favorite collagen benefit I’ve noticed is indeed improved skin texture and better hair, especially with the supplement I mentioned above. I’ve struggled with hair loss in the past, and I can tell a big difference in my hair quality. Supposedly collagen thickens the hair follicles, so hair has a thicker texture. (source) It’s worth noting, however, that hair loss can have many causes, so please determine what’s causing your hair to shed rather than just picking collagen as a quick fix (though it does make an excellent addition to any hair strengthening protocol). My nails grow so fast, and my skin looks better too, like it’s retaining better moisture, which is sorely needed for high altitude living up here in the mountains. Collagen decreases wrinkles, improves skin elasticity, and strengthens skin cells. In one 2013 study, the groups taking collagen saw a significant improvement in their skin’s elasticity as compared with the placebo group. It works! Collagen is also said to reduce cellulite, but I haven’t seen evidence of that. 2) Collagen is fantastic for repairing leaky gut. Did you know the cells in your gut lining have a high need for the amino acids that collagen provides? Collagen supports healing and repair of damaged intestinal tissue, providing the nutrients and raw materials the intestinal lining needs. Collagen is an excellent support to a gut healing protocol and is highly recommended for anyone with IBS, IBD, or reflux/GERD. 4) Detox and weight loss. Collagen is very rich in glycine, a precursor to glutathione, which is the most important antioxidant for liver detox. So collagen can support the liver’s detox pathways. And glycine may also boost metabolism. 5) Collagen is a great source of protein. You can get up to 20 grams of protein in certain collagen supplements. 6) Collagen can support healthy cardio function and may help lower high blood pressure. (source) Proline, an amino acid found in collagen, may help get rid of fat deposits in the arteries and repair tissue within the arteries. There are over 20 different types of collagen inside your body, but types I, II, III make up 80-90 percent. Type I is the most abundant in the body; type II makes up cartilage; and type III is a major component of the extracellular matrix in a variety of internal organs and skin. You can get collagen proteins from fish, beef, chicken, or pig. There is no vegetarian source of collagen available (because duh, it comes from the connective tissue of animals). Bovine (beef) collagen contains types I & III and is best for skin, hair, joints, and gut health. (source) Marine collagen is type I and works best for skin and beauty. Type II collagen makes up a major portion of the cartilage that cushions joints and is primarily found in chicken collagen. Type II will give you the best joint and cartilage support, but types I and III collagen also support tendons and ligaments. I’ve also read in my research that types I, II, and III are just “marketing ploys” and you can reap the benefits from any properly sourced collagen. (source) Honestly you can’t go wrong with any type of collagen, though I think beef works best. Marine collagen would be just fine if you are pescatarian. Sourcing collagen properly is super important. Always make sure your collagen is grass fed or organic and hormone free. I’ve done the most research on collagen peptides and have used two products that I absolutely trust and recommend. I can’t vouch for others, but like any supplement, there are a lot of bogus ones out there to watch out for. I use Vital Proteins collagen peptides and this hair-skin-joint collagen formula. I always take the powder form over swallowing the capsules because you can easily mix them with liquid, and they’re absorbed more quickly. Also you have to swallow a lot of the capsules to get the proper dosage. If you’re older than 25, you can reap collagen’s anti-aging benefits. If you have autoimmune disease, thinning hair, joint pain, or aging skin, you can’t go wrong. And I almost always recommend collagen peptides to those healing leaky gut. How much collagen should you take? You need a minimum of 5 grams per day to see any result. This collagen I’ve been taking clocks right in at 5 grams per serving and also contains vitamin C, which aids in absorption. It also contains MSM, glutamine, aloe, and other nutrients that promote skin, hair, and joint health. You can, however, take up to 20-30 grams per day. 15-20 grams is a good therapeutic dose for joints, skin, and leaky gut. The top end, 30 grams, is really only needed by those who work out a lot and are trying to build muscle. I recommend this collagen which you can easily mix into smoothies or drinks for a higher dose. Can I just drink bone broth? Well, yes, of course. Bone broth is rich in collagen, gelatin, and amino acids, but you’d have to drink a truckload to get the same benefits. I use and love bone broth for its many health benefits, but it just doesn’t contain the amount of collagen you need to get a therapeutic dose (AKA a dose that works). Bottom line: collagen rarely has side effects and can benefit anyone looking for improved skin, hair, joint, and gut health. Think I’ll have some right now. Recently, I bought complete collagen but I’m not sure about the dose. The medicinal ingredients for one scoop are : hydrolysed collagen (bovin skin) 10 g, L-tryptophan 100 mg, Vitamin C (calcium ascorbate) 60 mg, pineaple (ananas comosus var. comosus, fruit) 30 mg, papaye (carica papaya, fruit) 30 mg, silicon (silicon dioxide) 10 mg. Since there is only 10 g of collagen, I wonder if I can double dose. So I would have 20 mg for my leaky gut, but the other ingredients would double too (are the other ingredients safe too to double dose?). On the product, it is said to take one portion. Hi Stephanie, it should be fine to double the dose, but I can’t really give you accurate health advice about dosing products over the internet. I don’t know details about your health history, current meds, or anything that could possibly cause an issue, which is why it’s best to consult with your doctor/naturopath, etc. I just read that collagen should be taken on an empty stomach and not mixed with other foods. Do you think it’s a good idea to put it in my coffee (with some nut milk) 1-2hr after breakfast /2 hr before lunch. Or is there no influence to its absorbtion? THanks a lot!